Yep, it’s this time of the year, you can smell the mushrooms in the forest … and I’m searching for them as haunted! So, as fall is slowly peeping in, I can’t think about anything else than mushrooms and comfort food. 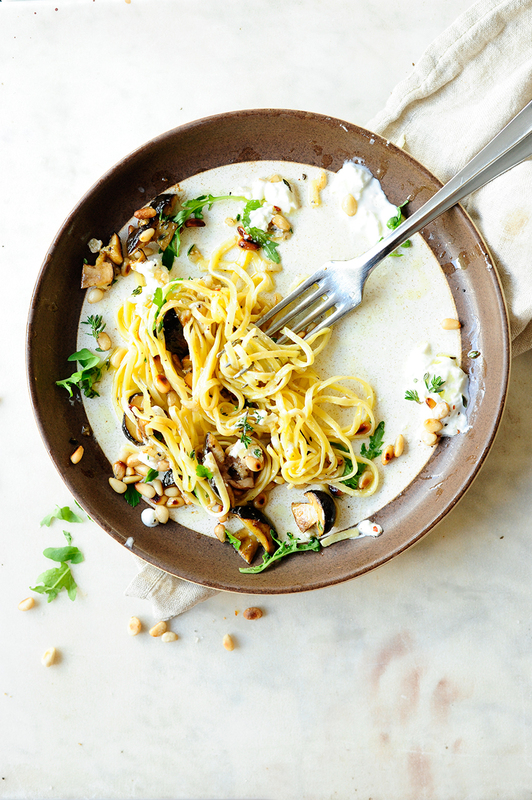 And this pasta is as comforting as it can get, it’s with lots of fresh porcini mushrooms, garlicky butter sauce, garnished with the right amount of freshly ground pepper and my new addiction… burrata cheese! 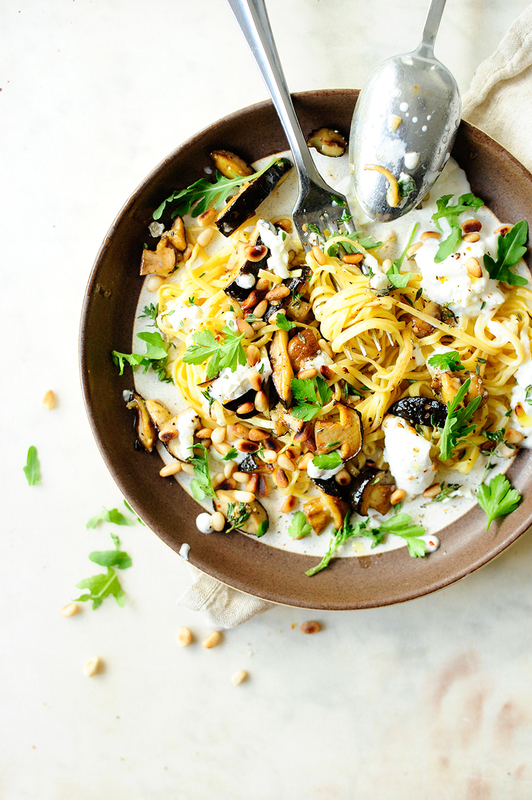 It’s a fast dinner, ready in 20 minutes, easy and incredibly tasty! Cook the pasta in boiling salted water until tender. Drain, leaving 1/3 cup of water from the pasta. Clean the mushrooms and cut into slices. Heat the oil in a skillet, add the mushrooms and cook over a high heat until golden brown. Add butter and garlic, cook for another 5 minutes. Add water from the pasta and lemon juice, sprinkle with thyme and simmer for 5 minutes more. Season with salt and pepper. 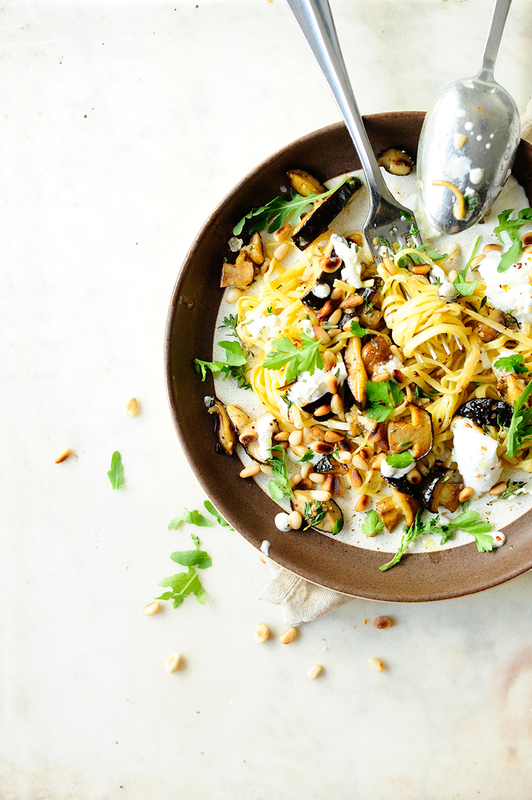 Stir with the pasta, sprinkle with parsley and serve immediately with burrata cheese, rucola and pine nuts. Eat!